At more than 900,000 residents, Metro Atlanta is a dynamic area, home to a diverse and growing population. The region provides the location, atmosphere and economics necessary for businesses to expand their operations and attract a highly skilled workforce. Gwinnett’s diverse population continues to grow, with more than 100 different languages and dialects spoken in households and a student population representing more than 180 countries across the County. One out of five Gwinnett residents was born outside of the U.S.
Gwinnett County boasts a diversity index of 78.6%, meaning that if two people are picked at random in Gwinnett County, there’s a 78.6% chance that the two would be of a different race or ethnicity (the national diversity index is 60%). We are “world class” community because the “world” chose to live, work and play in Gwinnett! Our international, cultural and ethnic diversity is unmatched by any other County in the state, region, and entire southeast. It has become the fabric of our identity. 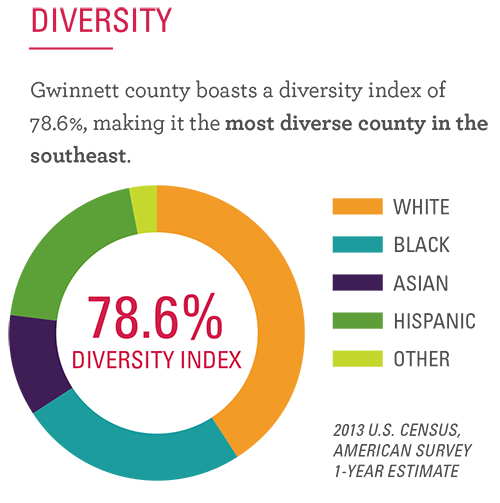 We continue to lead the way in leveraging this diversity to impact our business, government and non-profit communities.